There’s no question that payday is the best day of the week. Especially for those of you who are living pay check to pay check and paying off debt. While this lifestyle may suit some, it’s not for everyone. However, your financial situation is not always something you can control. Sometimes you will find yourself counting down the hours until your pay goes through and you can resurface as a cashed-up member of society. If this is a similar description to your current situation, we can assure you that you’re not alone. Despite the number of Australians living pay check to pay check, it can be a frustrating and worrying time. You’re constantly weighed down by the uncertainty of when exactly you’re going to run out of money and what you’re going to do if it is before your next pay check comes through. This becomes an even larger burden if your situation means that you can’t afford the necessities like healthy food (eating pasta 4 nights in a row doesn’t count) and household bills. 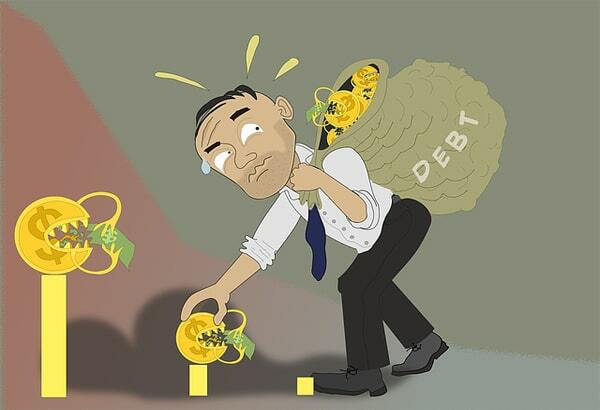 Throw debt into the equation and you’ve got yourself a pretty stressful situation. Thus, it opens the possibility of a completely downward spiral of credit cards, loans, temptation, stress, sadness and splurging. When you’re in this situation, the thought of not being able to pay off your debts is enough to make you want to pack up and leave the country. As responsible credit providers, we would always advise against this which is why we want to help in other ways. So, put your passport away and pack that suitcase back into storage. We’re going to show you how to kick your debt to the curb without skipping town. Whether you’re a pay check to pay checker. Or whether you’re a sucker for the sales with a maxed-out credit card. We’ll help you figure out how to tell your debt where to go. The first thing you need to do is commit to the cause. Although debt is a pretty natural part of life, it’s not something you want to ignore. If you want things to change, you have got to do what it takes to make that change happen. That might mean you need to give up buying your lunch every day or getting the jumbo-sized popcorn when you only ever eat half of it. Your sacrifices will be rewarded with a debt-free future. As soon as you start to see a dent in your debt, you’ll start to feel better and your commitment to budgeting while you’re broke will only continue to grow. So, let’s get into it, shall we? It’s a good idea to establish what your debts are, their amounts and their interest rates. Then, just like creating a budget, prioritise each debt in the order you want to pay them off. Your aim is to pay as much as you can afford off one debt, while just paying the minimum on the others until the first one is completely paid off, then you move on to the next one down the list. This is something you should get into a habit of doing, regardless of your income. A budget will help you make better decisions about how to spend your money. It will also give you an idea of how much you can afford to put towards your debt each pay check. To create your budget, you first need to note your net income (income after tax). If you’re on a salary and you earn the same amount each pay period then this will be easy. However, if you are a casual worker and your pay checks vary from week to week, you will need to sit down every pay day and adjust your budget according to your net pay for the period. Your next step is to order your expenses by importance. As enjoyable as your Netflix account may be, it’s not vital for your survival. So, make sure you’re realistic with how you list your expenses. Your aim is to have money allocated to all these categories. Then, whatever is left over is your splurge money. You will have already established your debt repayments in your debt plan. Now, you’ll just need to put these amounts into your budget and then make changes as your start to pay them off. If you know you’ve got a rego payment coming up, adjust your budget accordingly. You may go some weeks without much splurge money. However, if the necessities are covered, you will survive. That’s all you really need to do so it’s all good. If you’re using the work ‘broke’ to describe how you earn a decent amount but can’t seem to get on top of your eBay addiction, leaving you with no money to pay the bills, then you’re not actually broke. That’s a good thing because it means you can easily make some changes to the way you spend your money. Establish what it is you tend to splurge the most on. Then, unless it’s in the list of necessities, cut it out of your budget. You may think you need to add a 27th bucket hat from ebaycruiser99 to your collection. However, we’re telling you now, you don’t. If you are actually broke then don’t make it worse by making bad decisions. If your budget is already stretched thin then don’t go spending money on things you don’t need. Now that you have your budget in place and you’ve established the expenses that are completely necessary and the ones that aren’t, it’s time to start making cuts. If you’re serious about paying off debt then you’ll need to be as brutal as possible. Yep, this might mean you have to sacrifice your $5 barista coffee every morning or the $7 block of cheese you buy every week. You would have already prioritised your expenses when mapping out your budget so cutting down on those costs should be easy. Easy in the sense that you’ll know what to cut out, not easy when it comes to actually making the cut – that part will be really hard, but worth in the end. It might also be a good idea to take a look at some of your fixed costs. If you’re a home owner, you might want to look at cheaper rates on your home loan. If you’re renting then perhaps you could explore your options for getting cheaper rent. This might include relocating to a less expensive place to live, negotiating with your landlord or finding an extra housemate to help with the rent. The same goes for your utility bills. Do some research and make sure you’re getting the cheapest deal. If you find a cheaper option, change service providers. You could also consider downsizing your mobile phone package. The 8gb of data you’re currently paying for might not be a complete necessity to your life. If it’s not, cut the cord, you’ll be okay. It’s hard to pay something off it you just keep adding to it. Cut up your credit card, stop applying for a loan contract and stop going over your phone plan. We understand that all these things can be incredibly useful when you’re low on cash but your aim is to get out of debt, not create more for yourself. You’re not the first person in this world to live off your income alone and you won’t be the last. This means it is completely doable and something you will establish when implementing your budget plan. Avoiding adding to your debt will also help you keep up a positive credit score and will improve your overall credit history. Making extra money is the key to paying off debt. If you’re a freelance or part-time worker, try and pick up a few extra hours per week or even a second job. If you’re a full time worker you can still make some extra cash by selling your unused goods, picking up some babysitting or tutoring jobs or even jumping on Airtasker and doing some chores for cash. You might have a crafty hobby, you could find a way to make money from that. Open a market stall on the weekend or set up an online shop for you hand-made goods. Whatever you can do to increase your cash flow for paying off debt, do it. Any extra money that you make should go straight to paying off loans. Remember to always put lump sums towards one debt at a time while just paying the minimum on the others. If you are living pay check to pay check, unexpected expense can be a killer for your bank account. It’s likely that your budget is already stretched quite thin but try and put a bit of money away each pay day for your emergency fund. It may take you a while to build it up but once you get to about the $1,000 you’ll start to notice a little bit of weight off your shoulders. If you do manage to make some extra cash, you could also put some of it towards your emergency fund as it is basically a future debt preventer so also a worthy cause. One way to make paying off debt a little easier is to do a balance transfer. This basically just means that part or all of your credit balance you owe is transferred from one credit provider to another to save on interest repayments. With credit cards, you’re generally offered interest free periods when you first sign up so doing a balance transfer could give you a certain amount of time without having to pay any interest. A balance transfer is only worth it if you can find a credit provider with a very low interest rate, little to no balance transfer fee, a credit limit high enough to accommodate your previous balance and an introductory period long enough to pay off the balance before the interest kicks in. Paying of debt can be stressful, especially when you don’t have much money to spare. Tell your friends and family about your goals and ask them to hold you accountable. Get them to encourage you as you will find it so much easier to stay motivated to pay down your debt. You might even motivate your friends to do the same and then you can all be smart spenders together. You’re not going to tackle all of your debt overnight so don’t panic if it takes you a little longer than you’d originally hoped. Just concentrate on paying off one debt at a time and you’ll soon fall into a routine of making regular payments towards your debt. Track your progress, celebrate your successes and just stay cool as you keep chipping away. Paying off debt and kicking money stress to the curb Overall rating: 4.8 out of 5 based on 60 reviews.